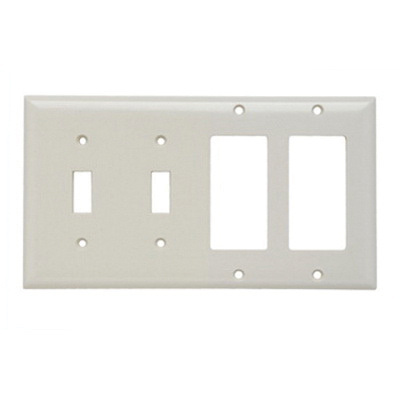 Pass & Seymour 4-Gang Standard size combination wallplate in light almond color, features rugged thermoset plastic construction with smooth finish. It resists discoloration, grease, oil, solvent and moisture. Rectangle wallplate measures 8.125-Inch x 4.5-Inch x 0.070-Inch. Screw mountable wallplate has two toggle switch and two decorator configuration. Combination wallplate is UL listed, CSA certified and RoHS compliant.